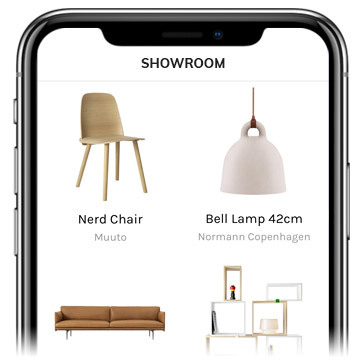 Allow customers to preview your furniture in their home with Augmented Reality. Improve purchase confidence and increase sales. Furniture retail is constantly evolving. It started in physical showrooms and transitioned to online marketplaces with companies such as Amazon leading the digital way. Now Augmented Reality allows customers to visualise your products in their home, removing hesitation and speeding up the sale process. Existing furniture retail leaves customers with too many questions – How does it look in my home? Will it fit in my space? What color fits best with my existing furniture? This results in lost sales and costly returns. Augmented Reality solves these issues by allowing customers to see realistic furniture in their space, leading to increased confidence and sales. INHAABIT provides everything you need to get started with a successful AR furniture retail solution. We build you a fully branded AR app with as many products as you would like to showcase to your customers. Our solution complements your existing website and retail strategy to help you build greater customer engagement and sales opportunities. INHAABIT use the highest quality and most realistic Augmented Reality models, to ensure what your customer’s experience is as good as the real thing. Augmented Reality helps customers become more engaged during the buying process. According to Google, 34% of customers would use AR for shopping and 61% would prefer to shop at places that offer AR. Companies such as Amazon, Apple, IKEA & Williams-Sonoma are already using Augmented Reality to better engage their customers. Your direct competitors will also be moving ahead. 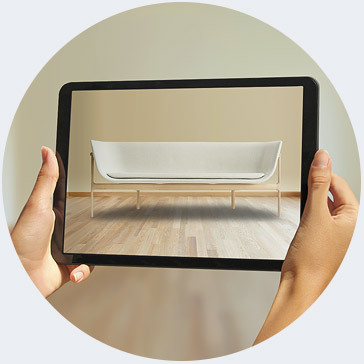 Expand brand awareness and reach more customers by allowing them to visualise your furniture in Augmented Reality.